For those of you who already know what this movie is, no introduction is needed. For those who don't, however, prepare to be astonished! Turkish Star Wars is one of the most entertaining examples of what can be achieved despite (or because of) having absolutely no money or resources to make a film. I have honestly never met anyone who has seen this movie that can't help but to smile upon the mention of its name, because it's so much fun to watch! This is one of the VERY BEST movies to sit around and watch with friends and just laugh yourselves silly. It has become legendary for it's wacky plot, frantic action sequences, hilarious dialog, and most famously the unauthorized use of footage and soundtracks from a number of other films, most prominently Star Wars and Raiders of the Lost Ark! This is not one to be missed for sure! 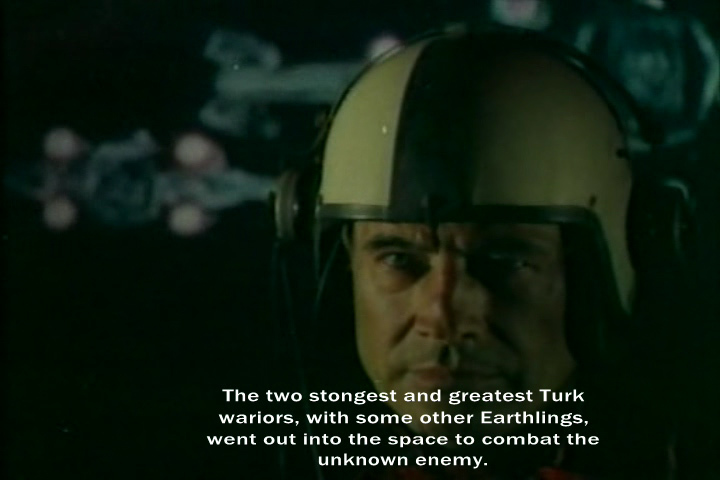 The film's plot (such as it can be called) follows the adventures of Murat and Ali, whose spaceships crash on a desert planet following a battle - depicted by using footage from Star Wars spliced with Soviet and American space program clips. 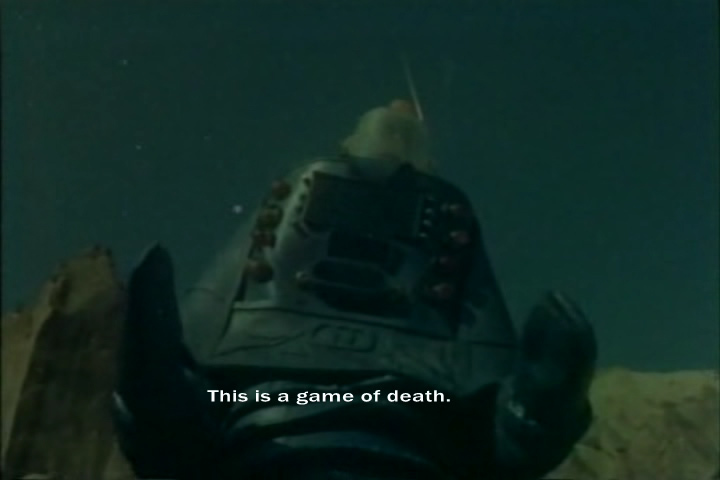 They are attacked by skeletons on horseback, machines that resemble Cylons from Battlestar Galactica, some kind of rubber trash can thing resembling Robbie the Robot, and a bunch of other monsters in bizarre outfits - all to the accompaniment of the Indiana Jones soundtrack. The main villain soon shows up and reveals his evil scheme to defeat Earth - but first he must find a way to penetrate Earth's protective shield of concentrated "human brain molecules" (which look exactly like the Death Star). More frantic battles take place, including one in a local bar spliced with scenes lifted directly from Star Wars (the Mos Eisley Cantina). 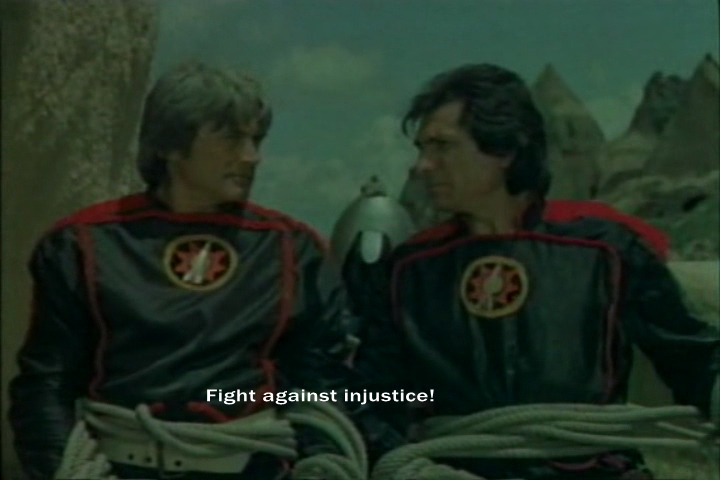 Eventually, Murat finds out about a sword made by "the 13th clan," who melted a mountain thousands of "space years" ago. Murat must find this sword in order to save the day. 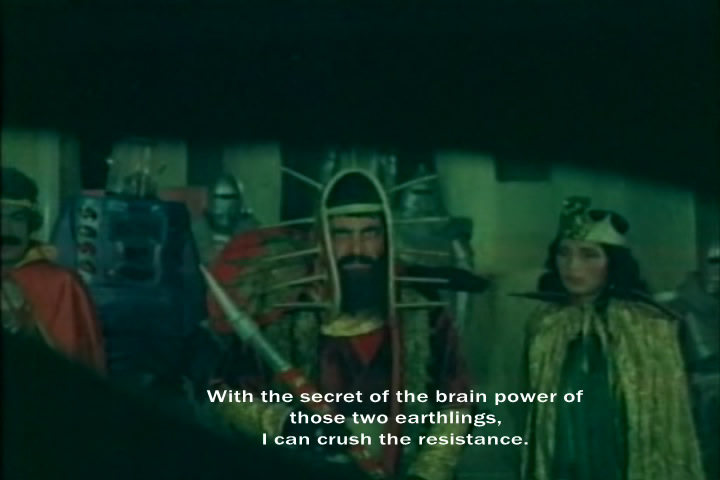 The film ends with a speech about the human brain being the strongest weapon in the universe.